The Other Blog: I Am the Lizard Queen! I’m on sabbatical from my teaching duties in order to write a book. I intended to write just one book. I ended up writing two. This is one of them. STRUCTURES: THE RELUCTANT WRITER’S GUIDE TO COLLEGE ESSAYS is a freshman composition handbook for those who dislike writing essays. Filled with straightforward information, easy-to-follow outlines, and essay examples, STRUCTURES demystifies essay writing and gives the reluctant writer support and confidence in a life skill that isn’t always pleasant but is always necessary. 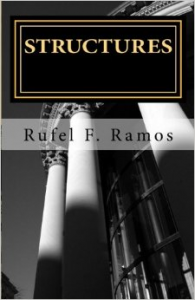 RUFEL F. RAMOS is an English professor at Eastfield College, a community college in Mesquite, Texas, just east of Dallas. She is also a survivor of a rigorous liberal arts education, a single mother, an aunt, a big sister, the oldest child, an adopted kid, an Asian-American, a US Navy brat, a bemused Catholic, a sci-fi/fantasy geek, a once-and-future globe trotter, and a writer. She often writes on any and all of those roles on her blog, thelizardqueen.wordpress.com and her website, rowenasworld.org. This entry was posted in Publications and tagged college essays, freshman composition, writing handbook. Bookmark the permalink. Pingback: Two Books in Two Months | I Am the Lizard Queen!